Why Is K Rend So Popular? Since its manufacture by Kilwaughter the kitemarked K Rend products have become among the most widely used and most popular exterior renders. Competitors will be wondering what makes the K rend products so desirable. Local Builder’s merchants in North Wales and major regional K Rend suppliers Richard Williams know exactly why; it’s high level of quality and great results mean customers demand K Rend. K Rend is an ‘architect’s choice’ product. Architects favour these products for exterior render and K Rend is even a member of the Royal Institute of British Architects (RIBA). The ‘National Building Specification Plus’ system means architects can create K Rend specifications there or by using the online Specification Writer solution for K Rend. This of course makes it easier and straightforward for architects to use K Rend and develop it into their design. End customers such as home owners also love K Rend’s results thanks to its natural look and finish. The addition of silicone means that the render is low maintenance and looks fresher for longer compared to other exterior renders. All K Rend products have a high quality finish and specific products and ranges offer key advantages, such as Silicone TC 15 due to its EWI properties (External wall insulation). The Silicone Thin Coat range is also particularly popular among builders because it is easy to use and spread. Spray applying can save a great deal of time. K Rend’s silicone technology is widely recognised and trusted by builders, builder’s merchants, architects and home owners. Since it is so easy to apply, yet provides a great finish for a long time K Rend is a great choice for your building project. 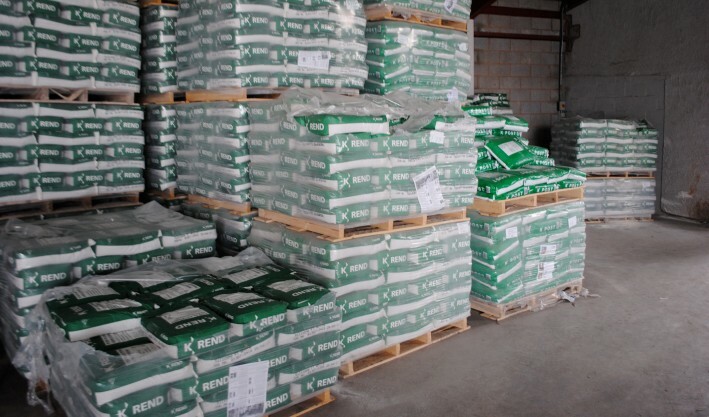 If you are based locally in North Wales contact Richard Williams K Rend Suppliers at either their Llandudno Junction or Ruthin depot to order K Rend now. If you have a small kitchen it can be become difficult to pick a design that suits your space. It would be great to have a luxurious kitchen with marble surfaces, a large island and all these integrated appliances installed too. However, that’s not possible for the vast majority of us, without having to knock into the next room or even upgrade to bigger property. There are a number of quality showrooms for kitchens in North Wales, the North West and the UK that provide inspiration on how to work with small spaces or awkward layouts such as diagonal walls, to help us get the kitchen we want. One thing you will always notice when visiting these showrooms, flicking through magazines or browsing various websites, is how organised they are. The key is to not increase your counter space, but to organise the storage space that currently exists. Incorporating more cupboards and then counter space will create more storage space, that’s an obvious observation, but this means you will have less space to stand and have social gatherings. From a design perspective, you can store things differently to how you normally would. Having lots of mugs standing on one shelf can take up space and some of us opt for a mug stand that holds approximately six. The only issue with the cup stands is the counter space it takes up that could be used for other useful utilities. A suggestion would be to have a number of steel hooks above the kettle which you can hand the mugs from, in a row. If you are a cooking enthusiast, then it’s no doubt that you have an endless supply of spice jars. One handy suggestion is to screw the lids of these jars underneath a shelf and you can then unscrew and screw the jars back on when you need them. With all the colourful spices available from cumin to paprika, this will also add a bit of vibrancy to your kitchen. Another ‘do it yourself’ task is one for all the boxes of foil, baking paper and cling film we all have laying in draws that are taking up valuable space. Simply get a magazine holder and attach this to the inside of a cupboard door. These are typically big enough to hold around 4 boxes and keeps them hidden away too for a tidier space. There are so many different ways we can create more space in our kitchen, without even redesigning our property or spending hundreds to thousands of pounds.